P&ID stands for Piping and Instrumentation Diagram or Drawing. Alternatively, it could also be called Process and Instrumentation Diagram or simply P&I diagram or drawing. P&IDs are also known as Engineering Flow Diagrams or Mechanical Flow Diagrams .P&IDs are often used in the process industry to show the process flow and other installed equipment and instruments. They show the interconnection of process equipment and the instrumentation used to control the process. A P&ID is a working document that is used by every discipline involved in the design, engineering and construction of process plants. It is used as a Process Plant Layout and Piping Design reference for checking engineering and design documents and drawings associated with a project. Information on process variables such as pressure and temperature. Specialty Items such as strainers. P&IDs play very important roles in plant maintenance and modification in that they demonstrate the physical sequence of equipment and system as well as how they all connect. During the Design stage they provide the basis for the development of system control schemes, allowing for further safety and operational investigations like HAZOP (Hazards and Operability Study). 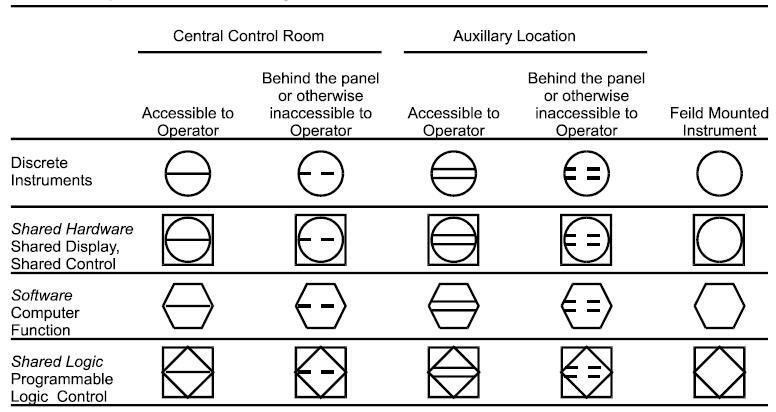 In the process industry, a standard set of symbols are used to prepare piping and instrumentation diagrams (P&IDs). 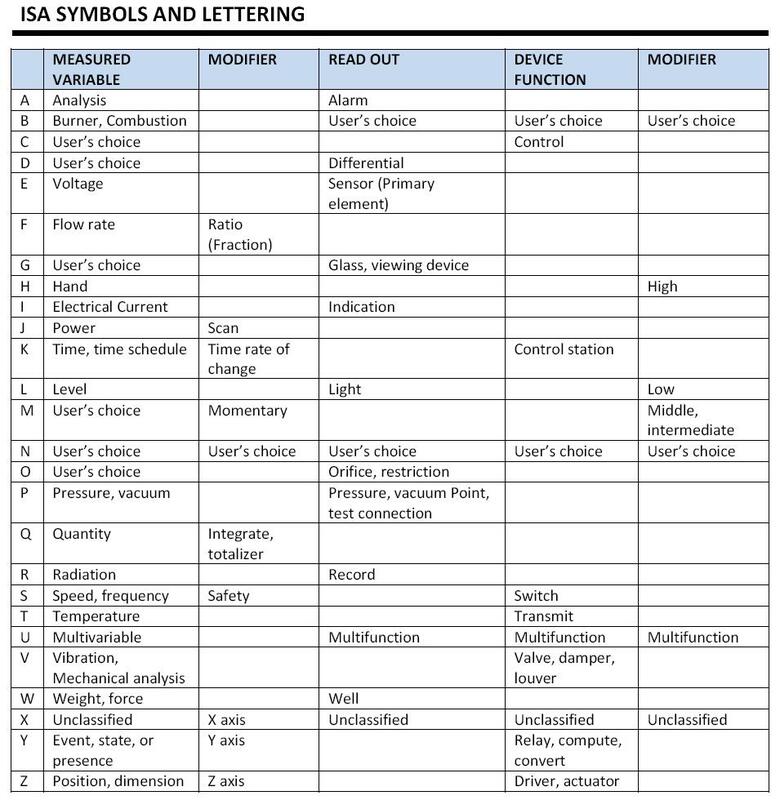 Most of the P&ID drawings you may come across have instrument symbols based on ISA standard S5.1 (ISA stands for Instrumentation Systems and Automation Society). Adding a single horizontal bar across any of the four graphical elements indicates the function resides in the primary location category. A double line indicates an auxiliary location, and no line places the device or instrument in the field. Devices located behind a panel-board in some other inaccessible location are shown with a dashed line. 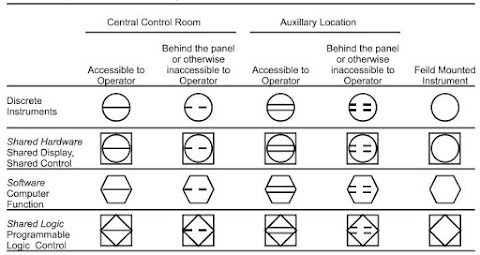 The table below gives a brief description of the four general P&ID symbols used in instrumentation diagrams. See common P&ID symbols used in developing instrumentation diagrams for details on the various symbols used in P&ID drawings. Letter and number combinations appear inside each graphical element and letter combinations are defined by the ISA standard. Numbers are user assigned and schemes vary. while some companies use sequential numbering, others tie the instrument number to the process line number, and still others adopt unique and sometimes unusual numbering systems.